In recent years, high-profile protest movements have erupted in several emerging and developing countries, roiling, and sometimes overturning, the political status quo in Tunisia, Egypt, Turkey, Ukraine, Brazil, Thailand and other nations. Millions have demonstrated, and activists have pioneered new forms of online engagement. However, a recent Pew Research Center survey finds that many people in these nations remain relatively disconnected from politics. Although most vote in elections, few take part in other forms of political participation. For example, across 33 nations surveyed, a median of just 15% say they have participated in a protest and only 9% have signed a petition. Indeed, large numbers say they would never engage in the various forms of participation included in the poll. Political engagement varies considerably among different demographic groups. The engaged are typically better educated and wealthier. Older people are more likely to vote, but younger people are more likely to participate in other ways, including online activism. Overall, few people say they post political comments or links to articles online, but these activities are much more common among 18-29 year-olds. Voting is considered the most useful form of participation on the survey: A median of 75% say it is an effective way to influence what government does. No other type of engagement is considered effective by more than 50%, although many do consider as effective attending campaign events, participating in protests and being a member of a political organization. Young people are more likely than their older counterparts to believe that many forms of political participation are effective, and in particular they are often more likely to say protesting is an effective way to influence government. The Middle East stands out among the regions surveyed for its relatively high rates of participation. In the home of the Arab Spring and its aftermath, a median of 53% fall into the “high” category of our participation index.1 Egypt, in particular, stands out. Twice in recent years, Egyptians have poured into the streets to oust a president – Hosni Mubarak in 2011 and Mohamed Morsi in 2013 – and 47% of Egyptians say they have participated in a protest at some point, the highest percentage among the nations surveyed. Morsi’s removal from office was ignited in part by a petition drive organized by the Tamarod movement, and 50% of Egyptians report having signed a political petition, by far the highest percentage registered in the survey. Egypt is also at the top of the list for the percentage of people who have been active members of a political organization, phoned a radio or television show to express an opinion and participated in a labor strike. Overall, political engagement is closely linked to an individual’s faith in government and belief that he or she can have an influence on political matters, or what scholars sometimes refer to as political efficacy. People who believe politicians care what they think participate in more political activities. Moreover, people who think a specific form of participation – protesting, for example – is effective are more likely to take part in that activity. These are among the key findings of a recent survey by the Pew Research Center, conducted in 33 emerging and developing countries among 37,620 respondents from March 17 to June 5, 2014. Overall, the study finds that participation rates vary significantly across the nations polled. Obviously, opportunities for political participation also vary widely across these nations, depending on the frequency of elections, the development of civil society organizations, and the presence of a political environment that permits free expression. 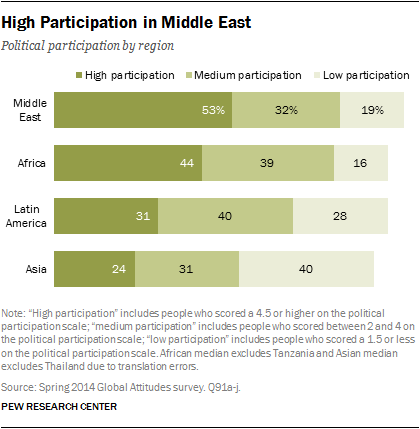 In addition to Egypt, political participation is also relatively high in several of the other Middle Eastern nations surveyed, including Jordan, Lebanon and the Palestinian territories. Tunisia has the lowest levels in the region, with just 17% reporting high political engagement, despite the fact that its 2011 Jasmine Revolution was the first of the Arab Spring anti-government protests. Along with Middle Easterners, Africans also report high levels of political engagement. Six-in-ten Kenyans are in the high participation category, as are 52% of Senegalese. Ghanaians report the lowest participation in the region, with just 24% among the highly-engaged political participants. There is relatively little variation across Latin American nations. About three-in-ten people in six of the nine countries surveyed report high levels of political participation. Nicaraguans report the highest levels of engagement (42%), while Salvadorans are the least likely to participate (22%). Involvement in politics is somewhat less prevalent in Asia. While about two-thirds of Bangladeshis (65%) report higher levels of participation, other Asian publics are less apt to participate. Pakistan (12%) is home to the lowest level of political engagement among the 30 countries included in the index. Indonesia (20%), the Philippines (21%) and Malaysia (26%) also have relatively low participation rates. The formerly communist Eastern European nations included in the survey also report fairly low levels of participation. Just 37% of Poles 28% of Ukrainians and 27% of Russians participate at high levels. Voting is by far the most frequent mode of political engagement in the countries polled, with a median of 78% saying they have voted. Voter participation is highest in Asia and Latin America (each with a median of 85%). Large numbers also say they have voted in Africa (77%) and the three Eastern European countries surveyed – Poland (75%), Russia (76%) and Ukraine (79%). Voting is much less common in the Middle East, where the opportunity to vote is often less frequent because of government instability and suffrage limitations. Across the region, when asked if they have voted in the last 12 months or in the more distant past, just 61% say they have voted. Lebanon and the Palestinian territories have not held national elections in five or more years. A median of 32% in the nations surveyed say they have attended a political campaign event or speech. Attendance is greatest in African nations, where 48% report participating in such events. Going to campaign events is less prevalent in the Middle East, Asia, Latin America and especially the Eastern European nations surveyed – just 12% of Russians, 19% of Ukrainians and 20% of Poles say they have gone to a campaign event or speech. Fewer people report participating in an organized protest of any kind (a median of 15% of those surveyed), being an active member of a political organization (14%) or contacting a government official (11%). Generally, Middle Easterners and Africans are more likely to engage in protests or join political groups than Latin American, Asian or Eastern European publics. Communication with public officials is highest in the Eastern European countries surveyed – roughly a third of Poles (35%) report contacting a government official. Relatively few people around the world have participated in labor strikes, signed a petition or phoned a live radio or TV show to express an opinion (a median of 9% for each). While few participate in these ways, Middle Easterners more frequently engage in the political system through labor strikes and call-in shows than their counterparts elsewhere. Across emerging and developing markets, just 7% say they have posted links to political stories or articles for others to read online, while 9% have posted their own thoughts or comments on political or social issues online. In 12 of the countries surveyed, these activities garner the lowest participation of all the political engagement activities tested. In large part, this is due to limited access to the internet in many of these nations. Online political activism becomes a more significant activity when looking only at a country’s internet users. For example, in Senegal, 29% of internet users (those who say they use the internet at least occasionally or who report owning a smartphone) have posted political comments online while just 8% of all Senegalese say they have done this activity. Though online political engagement is very low in Asia, Africa and Latin America, it is somewhat higher in the Middle East where a median of 13% say they post online political comments and 14% post online political links. Young people are much less likely to engage in some traditional forms of political participation, including voting and contacting government officials. 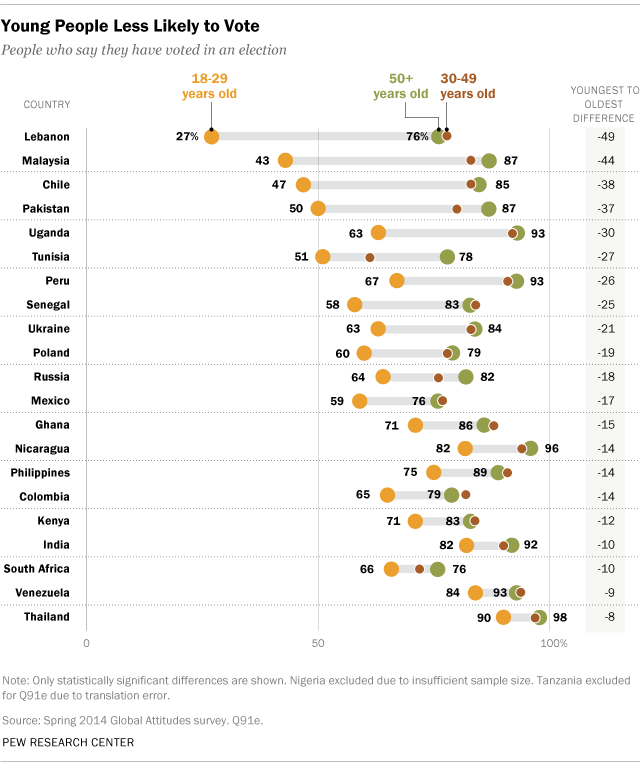 In 21 of 30 countries, young people are significantly less likely to vote compared with those age 50 and older, with differences of 15 percentage points or more in about half of the countries surveyed. In particular, there are dramatic age differences in voter participation in Lebanon, where 27% of 18-29 year olds say they have voted compared with 76% of those 50 and older – nearly a 50 point difference. This is potentially due to the lack of opportunity for younger voters since Lebanon has not held national legislative elections since June 2009. 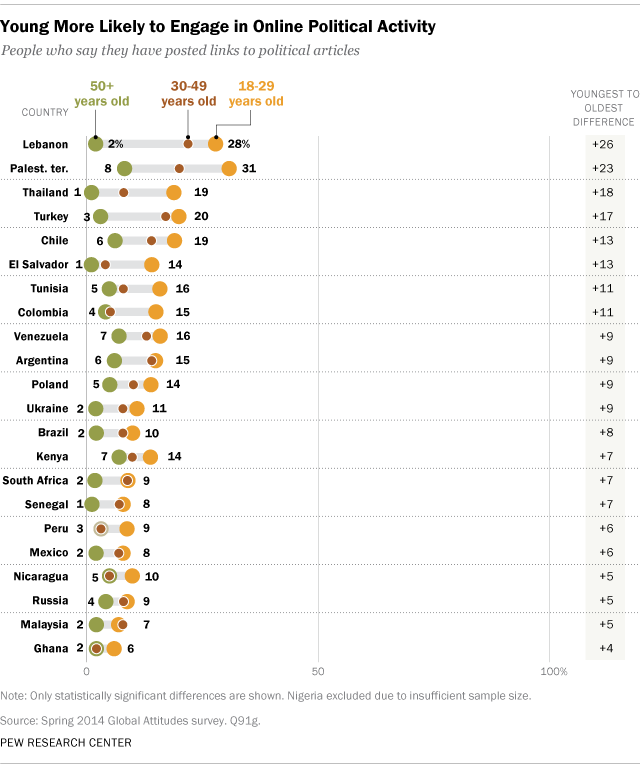 Young people are significantly less likely than those 50 and older to contact government officials in 11 of 30 countries, with some of the most substantial differences in Africa and Eastern Europe. Though young people exercise their right to vote much less frequently, they often participate in less traditional ways than their older counterparts, especially through online activity. While relatively infrequent across all countries, young people are significantly more likely to engage in online political activity. This is due at least in part to the fact that younger people are also more likely to use the internet. In 22 of 31 countries, 18 to 29 year olds are more likely to post links to political articles and post their own comments or thoughts about politics online. Some of the biggest age differences can be seen in the Palestinian territories where 35% of 18 to 29 years olds report posting political comments online, compared with just 9% of those 50 and older. About three-in-ten young Palestinians (31%) say they post links to political articles; only 8% of those 50 or older do the same. To further explore the relationship between demographics, political efficacy and overall political participation, we used a statistical technique called multivariate regression, which allowed us to test the individual impact of a number of factors on political participation while holding other variables constant (see Appendix for additional details). Overall, we find that education, political efficacy, gender and age have the biggest impact on whether someone participates in politics more frequently. Education, political efficacy and gender have strong positive influences on individual political engagement. Those with a secondary education or higher, those who believe government officials care about their opinions and men participate in political activities at much higher rates. In addition to these factors, being employed and having a higher income also have a significant, positive impact on political engagement, though to a lesser degree. Age also has a significant influence on political participation, controlling for other demographics. In emerging and developing markets, older people are significantly less likely than their younger counterparts to participate. While older people do vote more frequently than young people, they engage in some of the other political activities, particularly those done online, at lower rates than their younger counterparts in many countries. On average, people in emerging and developing economies have low political efficacy. Majorities or pluralities in 31 of the 33 countries surveyed say that most government officials do not care what people like them think. This view is especially common in Latin America, where a median of 77% say their political opinions matter little to politicians, compared with just 13% who say government officials do care and 5% who volunteer that neither or both are true. The belief that government officials ignore average citizens is particularly strong among Brazilians, 90% of whom say their government does not care. About two-thirds in the Middle East (67%) and Africa (65%) express doubts that political leaders pay attention to their opinions. In fact, South Africa is the only country surveyed in these two regions where fewer than half (43%) hold this view. Across these regions, roughly two-in-ten believe politicians care (19% in the Middle East, 20% in Africa). Political efficacy in Eastern Europe is similarly low. More than seven-in-ten in the three nations surveyed believe that government officials care little about the views of people like them. Ukrainians have the lowest political efficacy with 83% saying that officials care little about their opinions. Political efficacy is highest in Asia, but a median of 55% across the region still say that government officials do not care about what they think. Roughly a quarter (23%) believes politicians pay attention to their opinions, while 10% say neither. Filipinos far and away have the highest political efficacy of those surveyed. The Philippines is the only country in which at least half (52%) say government officials care about what people like them think. Still, more than a third (36%) believe politicians care little about their concerns, while 8% agree with neither or both. Among the forms of political engagement included on the survey, voting in an election is seen as the most effective way to influence what government does. A median of 75% across the emerging and developing economies polled say voting is very or somewhat effective. In every nation where the question was asked, voting holds the top spot among the 10 political activities included. Voting is viewed as a successful means for influencing the political process in Asia, where a median of 80% believe it is effective, though Africans and Latin Americans are not far behind (78% and 74%, respectively). Two-thirds of Middle Easterners also agree that voting is a useful tool in shaping government outcomes. Those in the Eastern European nations surveyed have quite varied opinions of the impact of the franchise. Three-quarters of Ukrainians say voting is an effective way to influence government, while just 51% of Poles say the same – the lowest of any country surveyed. A median of 50% say that attending campaign events or speeches is an effective means of political change. Africans (62%) are more likely to see the political effectiveness of attending such events compared with Middle Easterners (51%), Asians (51%) and Latin Americans (39%). Just 39% of Ukrainians, 29% of Russians and 27% of Poles agree that attending campaign events is politically effective. Roughly four-in-ten across the 32 nations surveyed believe participating in organized protests (42%), being an active member of a political organization (40%), participating in labor strikes (38%) and phoning a live radio or TV show to an express an opinion (38%) are effective means of political participation. Africans and Middle Easterners are generally more likely to consider these useful ways to affect political change. About one-third believe that signing a petition (35%) and contacting a government official (34%) are effective in influencing government. Again, Africans are more likely to say these are effective. Asian publics are less likely to say signing a political petition will make a difference (27%), while Middle Easterners are less likely to see the value of contacting government officials (31%). The two forms of online political activity tested on the survey are considered the least effective means of influencing what government does. Medians of only 27% see posting links to political articles online and posting online comments on political issues as useful tools of governmental change. 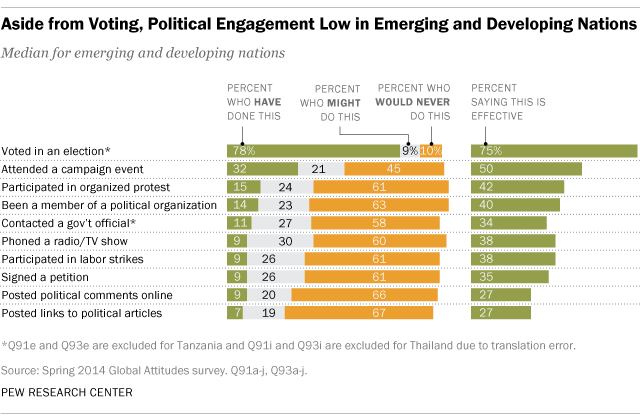 In 24 countries, one of these online political activities has the lowest effectiveness rating of the political activities tested. While relatively low across all regions, online political participation is seen as somewhat more useful in Africa and the Middle East, where roughly a third view it as effective, compared with about a quarter of Asians and Latin Americans. Like online political participation, in many countries internet users are much more likely than the general population to say online political activities are effective. For example, 40% of internet users in Tunisia say that posting links to political articles online is effective, compared with just 13% of the offline population. Effectiveness of political activities is strongly related to participation in that activity. In all of the countries surveyed, those that say attending a political campaign or event is an effective way to influence the political system are also more likely to say that they have attended a political campaign or event. This relationship generally holds for all other political activities tested. 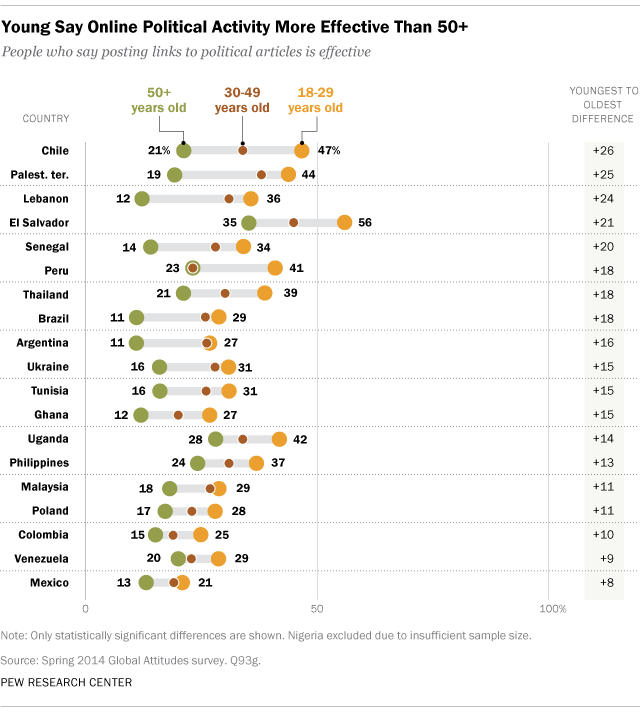 There are also age differences in the perceived effectiveness of certain political activities. In more than half of the countries surveyed, young people ages 18 to 29 are more likely than those 50 and older to say posting links online to political articles is effective (in all countries surveyed, young people also have higher levels of internet access). For example, in Lebanon, 36% of 18 to 29 year olds say posting links to political articles is an effective way to impact government while just 12% of those 50 and older say the same – a 24 point difference. Significant age gaps can also be found on views of the effectiveness of posting online political comments. 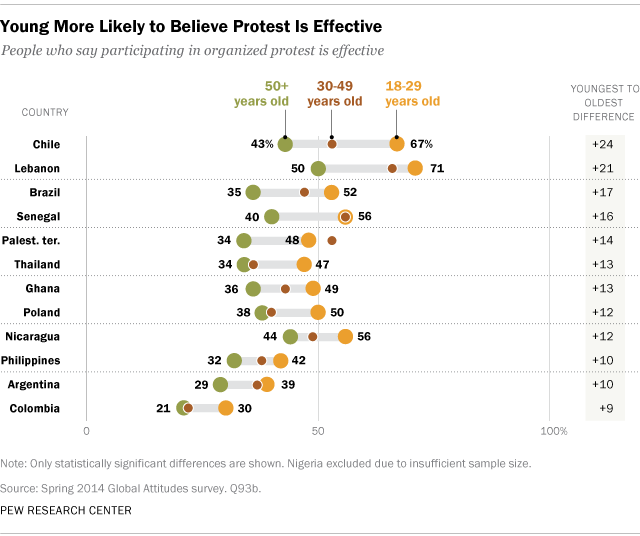 Though differences with those over 50 are less common among traditional political activities, in many countries young people are also more likely to think that forms of protest are effective ways to influence government. In 12 countries surveyed, young people are significantly more likely to say that participating in organized protests is an effective means of influencing government. Young people in 10 countries are also more likely than those 50 and older to say participating in labor strikes is effective. In Chile, where last year thousands of students joined protests to demand education reform, two-thirds of 18 to 29 year olds believe organized protests are affecting change in government while just 43% of those 50 and older agree. Large age differences also exist in Brazil, where widespread protests over social issues ranging from rising bus fares to the use of public funds for the World Cup, have plagued the country recently. In addition to age, in some countries there are significant differences in perceived effectiveness of political action by education. Generally, when differences appear, highly educated individuals are more likely than less educated people to believe that political action is an effective means of influencing government. For instance, two-thirds of highly educated Nigerians say attending campaign events is an effective political activity, while about half (51%) of those with less than a secondary education say the same. Differences in opinion by education also occur on the effectiveness of other political actions, especially in online political activities.